The lack of a skilled and ready workforce is consistently identified as the number-one barrier to economic development and diversification of our economy. 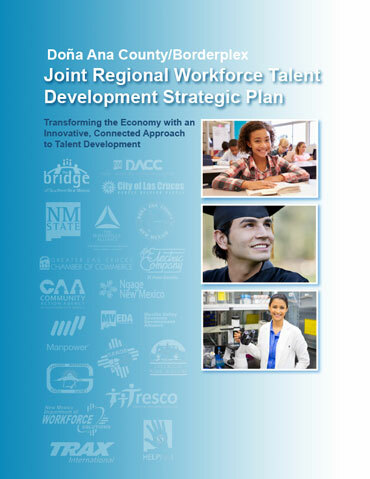 Working hand-in-hand with all of the key players and partners in building a highly skilled and ready workforce, The Bridge of Southern New Mexico is leading the next steps in not just a plan, but forging the partnerships and resources needed to make it happen. Thanks to the passion and commitment of a growing set of cross-sector partners on the Workforce Talent Collaborative, a clear plan and path to a comprehensive approach to workforce development has emerged that can transform the future of the region by boosting the earning potential of its citizens. The plan harnesses the collective assets already in place and identifies the gaps that need to be filled for us to build a ready, highly-skilled workforce that will drive short and long-term economic development for us all. To read the Executive Summary click here, to read the full Strategic Plan click here. The Collaborative has outlined the alignment needed to equip those who are here now with the skills and knowledge needed to be successful in higher-paying careers and career ladders. The goal is not just about jobs, it’s about driving the holistic development of these industries. Building the regional Workforce Talent Pipeline needed for success requires a combination of new and existing tools and relationships, as well as targeting our collective community assets to support the holistic talent development for eight targeted industries. A skilled and ready workforce in these eight industries will ripple across the county in an economic cascade of increased incomes and buying power. At the same time, it improves the social determinants of health historically linked to the pervasiveness of poverty here. 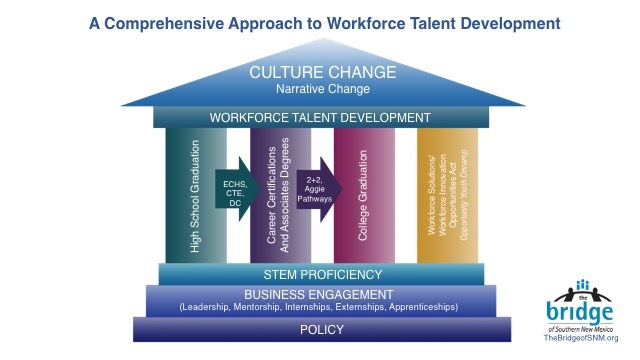 Therefore, as we move forward in laying out the strategies and tactics for building highly-skilled workforce talent in a way that drives economic development, we begin with a foundational understanding that developing a comprehensive workforce entails mobilizing all members of community toward the goal of workforce talent development. This, in turn, will have far broader impact in changing the dominant, primarily negative narrative of this region and foster a cultural shift toward completion, economic stability, and high expectations. When the hallmark and reputation of our region becomes the quality and depth of diverse and highly-skilled talent in these eight target industries, we will unleash the economic potential of this region. We will break the generational hold of poverty and improve the quality of life of individuals, families, neighborhoods, communities, and the region, as a whole.